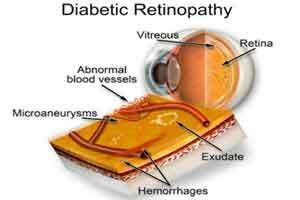 Diabetic retinopathy (DR) is a common micro vascular complication of diabetes. It is a progressive eye disease that is characterized by an asymptomatic non-proliferative stage (NPDR) and symptomatic proliferative stage (PDR). The PDR stage, together with diabetic macular edema (DME), which can develop at any stage, are the primary causes of vision loss in people with diabetes. Research is needed to clarify inconsistent findings regarding the association between diabetes-related eye complications and psychological well-being.